Yesterday, I wrote that a Black president singing "Amazing Grace" at a Black church on national TV was the Blackest thing that has ever happened. I said it passed peak Blackness and entered gravitational time dilation Blackness. Dark matter, event horizon Blackness. Undiscovered dimension Blackness, redefining our understanding of how Black Blackness could be. And then I woke up this morning. And read about Bree Newsome. 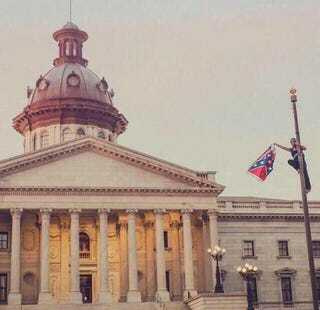 A woman identified as Bree Newsome was arrested Saturday after climbing the flagpole at the South Carolina Statehouse in Columbia, S.C., about 6:30 a.m. and removing the Confederate flag, Rashad Robinson, executive director of ColorOfChange.org, said in a statement. And maybe I spoke too soon.